I know this is a VERY overdue post, however this morning I've finally gotten my backside into gear and get this post sorted. So my hair I think has nearly been every shade under the sun (just about), I've been dark brown, light brown, blonde, red/brown, and now I think I have finally come to a hair colour which I am in love with- my red hair. As you all know red hair is a pain to keep the colour in, however if you ever meet Stephy I think she is the only person in the world who's red hair is the same colour when she dyes it and it lasts until she gets it done (and she doesn't use any products on it). I only get my hair dyed every 5-7 weeks depending on if I'm going out etc, I've managed to time my colourings ready for Holly's wedding in a couple of weeks and then, until I go away on holiday. Now this is going to sound a bit rank, however it works for me and before people start going ewwwwwwww what a skank, I only wash my hair twice a week, and use batiste on it everyday. The less you wash your hair the less colour will come out. So how I am going to do this post, is how I would do my hair mid week (as normal) and then Saturday if I was going out or stopping in. Hopefully it will make some sense to you all. 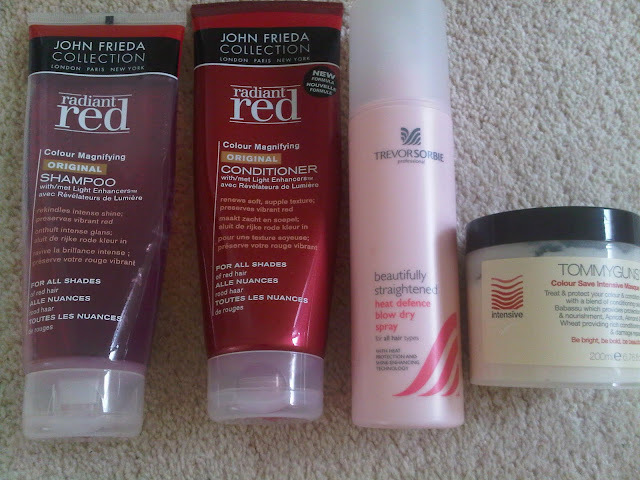 John Frieda Radiant Red Shampoo/Conditioner- Believe it or not, I actually HATE this shampoo/conditioner and the reason why I use it is purely due to the fact that there is hardly no shampoo/conditioners specifically for red hair on the high street. The shampoo hardly lathers, and you have to use the teeniest amount of conditioner other wise your hair will look a greasy mess. If anyone has any suggestions of red shampoo/conditioners let me know. Trevor Sorbe Heat Defence Blow Dry Spray- Even if I leave my hair to dry natually (very rarely) I always use this, and obviously use when I'm blow drying my hair. Normally this can be found in Boots on offer, and the bottle lasts for ages- I've been using this since the beginning of the year. Tommyguns deep conditioner for coloured hair- I originally recieved this to review (still need to write it up- bad blogger I know) and this is my second tub (bought myself), you may have seen this mentioned in a monthly favourites- think it may have been June (??). I only use this once a fortnight starting from the week after I get my colour done. This has really improved the condition of my hair. I used to use Phillip Kingsley Elasticizer, however this is a cheaper alternative and works just as well. Saturday wash- if I'm stopping in at the weekend. 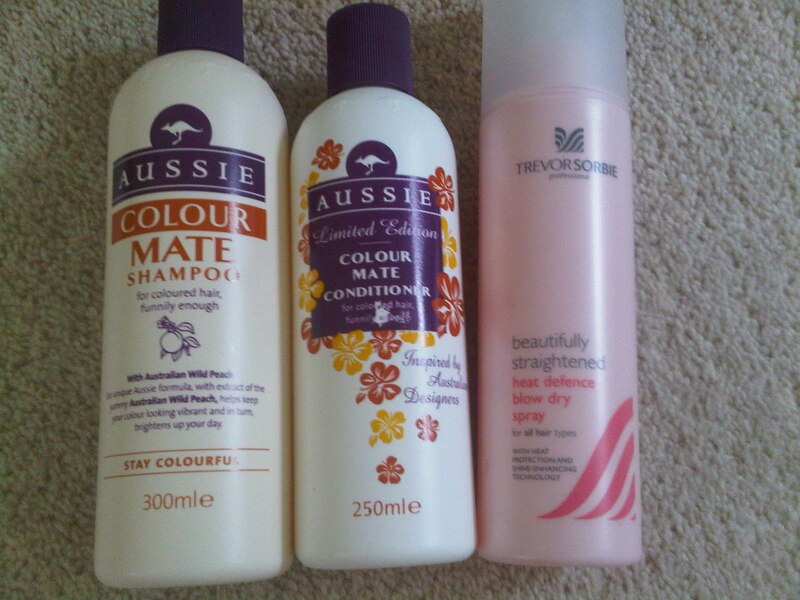 Aussie Colour Mate Shampoo and Conditioner- I can't tell you all how much I love this shampoo and coniditioner. I could be here all day/night. I know this is a favourite amongst you all, and I'd be lost without it. 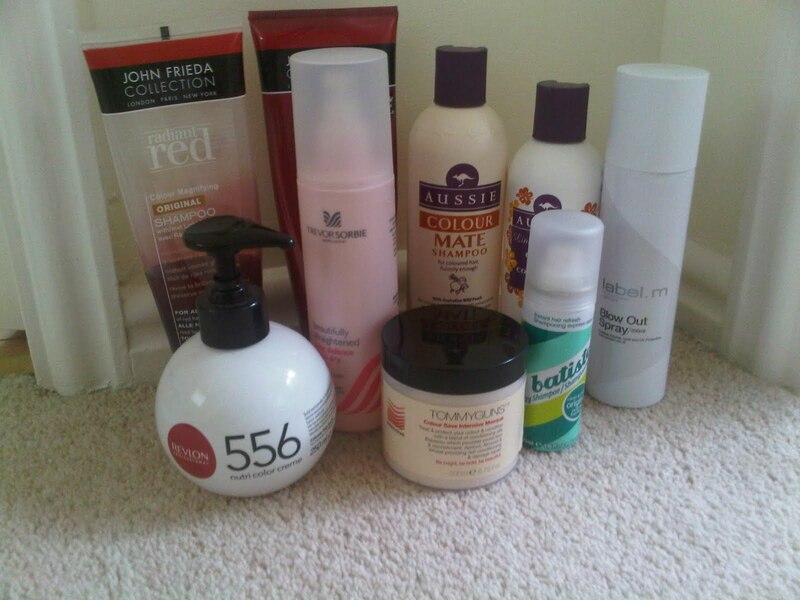 This kept my hair decent while I was in Tenerife. Trevor Sorbe Heat Defence Blow Dry Spray- you get the jist. If I'm painting the town red on Saturday night (no pun intended). 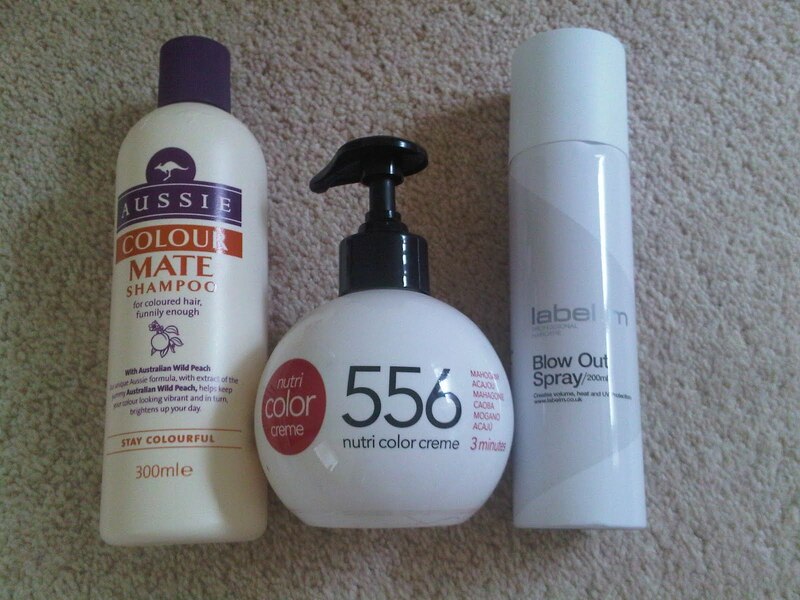 Aussie Colour Mate Shampoo (note just the shampoo)- makes my hair silky soft and shiny. Revlon Nutri Color Creme (mahogany)- Now if you have red hair (or actually any coloured hair- they tailor for all colours), this is a little saviour in a bottle. This conditioning treatment actually puts colour back into your hair. I only start using this at least after two weeks after my colour has been done, about 5 pumps covers my entire head (and my hair is long) and leave for only 3 minutes, rinse off- HELLO REDDER SHINY HAIR. I never use this if I'm not going out, and my hairdresser has noticed how much it keeps the colour in. The advantages of this being that when colouring my hair instead of colouring my roots, and then the rest of my hair (taking at least 90 mins) I can be in and out of the hair dressers in less than that. The website I got mine from (I think this is the cheapest) is from here. Also you do need to wear rubber gloves when doing this as the colour stains your hands. Label M Blow Out Spray- This product is a heat protector and it adds volume to your hair. I normally spray my roots and then the ends of my hair with this. I try not to use too much of it as sometimes it goes a bit sticky once your hair is dry. I think I paid about £10.50 for this from Toni and Guy, however I've had it nearly a year and only used about half a tin. This only gets used on "special" occasions. As you all know I love my hair extensions and I normally get those coloured once every 4-5 months just so I know its an exact match for my hair. I know some people have asked what colour my hair is, and as I go to my cousins all what I can tell you is that its two thirds red, mixed with a third reddy brown- its basically a bright mahogany (if that makes sense). The only other tip I can give to you is use batiste as often as you can to keep grease away and try not to touch/play with your hair as this can make your hair greasy. Normally for work I have my hair up in a top knot or a ponytail. Oh and on a parting note- your bath will look like a scene from a bloody movie after every wash. I'll be doing a more detailed blog on this on my blog in the next few weeks!